Ukha (Russian: Уха) is a clear Russian soup, made of fish like salmon or cod, root vegetables, parsley root, leek, potato, bay leaf, lime, dill, green parsley and spiced with black pepper, cinnamon and cloves. Fishes like perch, tenches, sheatfish and burbots were used to add flavour to the soup. Left: Ukha made with perch. Ukha is a fish dish, made with broth. However calling it a fish soup would not be absolutely correct. "Ukha" as a name in the Russian cuisine for fish broth was established only in the late 17th to early 18th centuries. In earlier times this name was first given to thick meat broths, and then later chicken. Beginning from the 15th century, fish was more and more often used to prepare ukha, thus creating a dish that had a distinctive taste among soups. A minimum of vegetables is added in preparation, and in classical cooking ukha was simply a rich fish broth served to accompany fish pies (rasstegai, kuliebiaka, etc.). 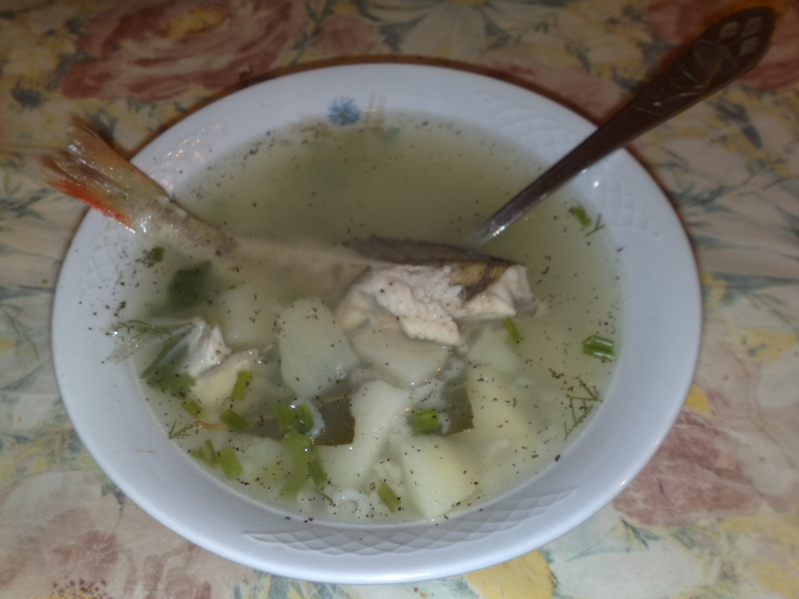 These days it is more often a fish soup, cooked with potatoes and other vegetables. A wide variety of freshwater fish can be used. There is an opinion that you can not make a good ukha from seafish. Fresh fish is best to be cooked, so if it is frozen it is better not to defrost it. Preference is given to smaller, younger fish, with the tail part of bigger fish discarded.